Now here’s an innovative way to have a green wedding. Recycle your way to the alter. According to a story found on Yahoo Green, one couple paid for their eco-friendly nuptials by recycling 400,000 cans. They’re known as the “wedding can couple” and with good reason, they are paying for their July 31 wedding solely with the $3,800 in proceeds they earned from recycling 400,000 cans. These natives of Spokane reached their goal last week and will now start saving for their honeymoon as well as upcoming donations to Doctors Without Borders and Rim Country Land Institute through their can collections. Peter Geyer and Andrea Parrish started a Web site and drew traffic to the site with social networking. Alcoa donated 150,000 cans and United Recycling Services donated 73,000 cans to help the cause. Read about their low impact wedding here. Even if Geyer and Parrish hadn’t raised the money through recycling, they still planned to have a low impact wedding and you can too. Start by downsizing your wedding to cut your consumption. Fewer people = less stuff generally. Make it vegetarian, skip the flowers, skip the favors, and choose an outdoor setting where less decor is necessary. To me the bottom line is to remember why you’re getting married in the first place and skip all the fuss. For some reason the summer bugs are all about me this year! Found this short but sweet list of easy, good for you, bug spray alternatives, check them out.. This works great for ants and other small pests. Boil 2 or 3 cups of water. Add about ½ to 2/3 cup of chopped hot pepper. Let marinate for a few minutes. Run the mixture thru a sieve to remove the peppers. Put the liquid in a squirt bottle and use when necessary. Be careful not to spray directly on foliage. This is great for ants. Mix 2 tbsp of Dr. Bronner’s mint soap with a gallon of water. 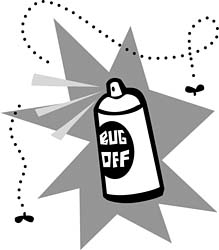 This will also work to ward off other pests on foliage however be care when you spray it directly on your plants. It has been known to burn some plants if too much is applied. Dab a little on you wrists, neck and behind the ears. Many insects don’t like the smell. Mix witch hazel with a few drops of tea tree oil, lavender oil, or peppermint oil in a squirt bottle. You can also add one of these essential oils to an unscented organic lotion for a bug repelling moisturizer. Rub a lavender flower behind your ears, wrists and neck. Not only will you smell great but mosquitoes will leave you alone. The heat is blazing across the country right now, so here is a fabulous alternative to saving energy.